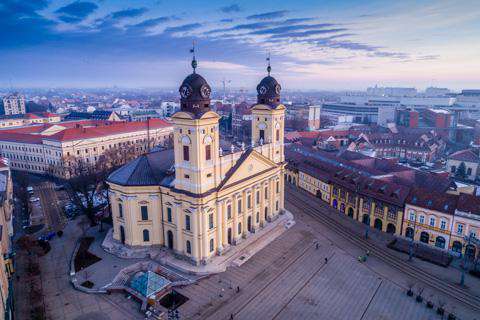 How much does it cost to travel to Debrecen? How much money will you need in Debrecen? Ft13,109 ($46) is the average daily price for traveling in Debrecen. The average price of food for one day is Ft4,588 ($16). The average price of a hotel for a couple is Ft13,143 ($46). Additional pricing is in the table below. These average travel prices have been collected from other travelers to help you plan your own travel budget. Finding its beginning as a collection of agricultural villages, Debrecen has grown to become the second largest city in Hungary as well as the regional center for the Northern Great Plain region. Highlights include the Reformed Great Church of Debrecen, Hortobagy National Park, Deri Museum, and the Debrecen Zoo and Botanical Garden. The center of activity and much of Debrecen's history lies at Kossuth Square and the Reformed Great Church. As the hub of the Reformation movement in Hungary, the church is an important landmark to the city's history and culture. It also houses the 56-ton Rakoczi Bell, which can sometime be heard all the way in Hortobagy National Park when the weather is clear. The Reformed College is also a landmark to Debrecen. Having been in operation for centuries, the school pays tribute to its more influential alumni with displays of memorabilia at the Oratorium, the Big Library, and the Exhibition of School History and Religious Art. For a deeper insight into the ethnography, history, and culture of the general area, the Deri Museum also offers permanent collections which include the history of Debrecen from the 13th century until the Reform Era, The art of Mihaly Munkacsy, the Deri-collections, Birds of Our Region, and World of Minerals. It is additionally famous for grandiose paintings of the Christ Trilogy. Away from the bustle and more popular historic sights, an experience a little closer to nature lies just outside the city in Hortobagy National Park. The largest flat grassland of Central Europe, Hortobagy is home to unique habitats teeming with wildlife. It is the first and largest national park in Hungary as well as an UNESCO World Heritage Site. It can be reached by train from the Grand Station which leaves every two hours. There are a number of pedestrian squares and areas of interest throughout the city, each with a unique atmosphere. Kossuth Square, for example, is home to the Great Church surrounded by an old-world courtyard, while Kalvin Square is surrounded by creative shop windows and mouth-watering displays of confectionery. Deri Square, home to the Deri Museum, is also surrounded by beautiful greenery for a peaceful escape from the commotion of city life. Another hub is Piac Street in Kossuth Square, a former market which is today always bustling with public events and entertainment. Baltazar Dezso Square is the youngest square of the city, Csapo Street Promenade offers a blend of 19th-century cafes and a busy mall, and the Forum Shopping Center & Debrecen Mall holds a selection of shops, fashion stores, a fitness center, pharmacy, fast food, banks, telecom, cinema, bookstore, game shop, dry cleaner, and more. Hal Lane is another small piazza worth visiting, usually busy with cafée, exhibitions, and concerts. Located just north of the downtown is a 2,280-hectare city park, Nagyerdo Park, which offers several opportunities for fun and entertainment. Within the park is the University of Debrecen established in 1538 as the Calvinist College of Debrecen, an amusement park, zoo, skating rink, stadium, botanical garden, and a resort called Aquaticum which has a water park, public pool, bath house, hotel, and restaurants. Cuisine of Hungary is primarily based on meats, seasonal vegetables, fruits, fresh bread, dairy products, and cheeses. Paprika is used generously in cooking and is considered the national spice. Goulash, a soup or stew of meat and vegetables and seasoned with paprika and other spices, is especially popular and common throughout Hungary. Other specialties include stuffed peppers, cabbage rolls, roasted meats, and casseroles, as well as a hot and spicy fish soup called halaszle, a chilled sour cherry soup called hideg meggyleves, and Hungarian crepes called palacsinta which can be stuffed with jam, cheese, raisins, or meat. Being a large city, Debrecen will have plenty of traditional Hungarian dining options in addition to international flavors like Indian, Italian, or Asian. One particular specialty of the city is called the debrecen - a pork sausage heavily spiced with paprika and other seasonings like garlic, pepper, and marjoram. Debrecen is home to one of Hungary's international airports, the second largest airport in the country behind Budapest. It is served by airlines with direct flights to many European cities. For those traveling from Budapest, there are trains operating between the two cities each hour during the day. InterCity trains take about two and a half hours to reach Debrecen, and also stop at Budapest Airport. Driving from Budapest to Debrecen will take about two hours from the M3 motorway to the M35. Once within the city, the best way to navigate is on foot, though there are also trams, trolleybuses, and buses around Debrecen and its suburbs.